2013 represents the 20th anniversary of our building, the Centennial Complex. A few weeks ago, the AHC staff and faculty had an informal commemoration of that historical landmark. Since most of our readers are not able to personally tour our landmark building, perhaps a guided tour in words and pictures would be enlightening. What would evolve into the American Heritage Center began in 1945, with the donation of the Western history collections of Grace Raymond Hebard. 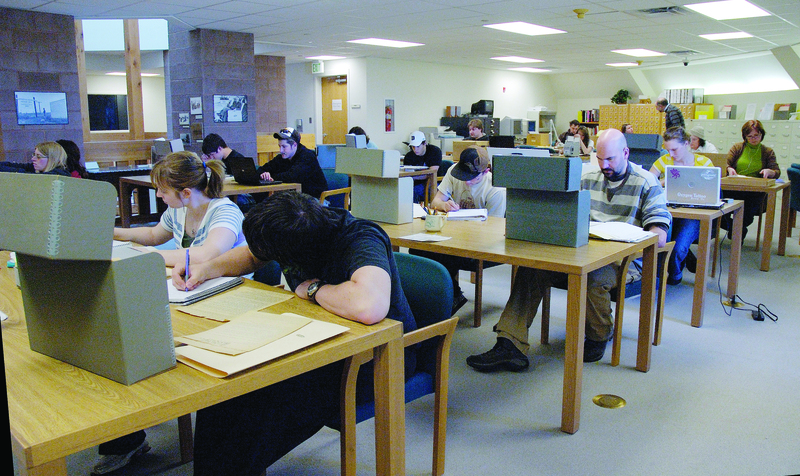 Over the years, the collections grew exponentially, until by the 1980s the AHC occupied two floors of the William Robertson Coe Library on UW’s main campus…plus two warehouse spaces elsewhere in Laramie. UW undertook a major fundraising campaign in honor of its centennial (1886 if using the year the school was created; 1887 if using the year the school opened). The single largest portion of that campaign was for a major structure to house both the American Heritage Center and the University Art Museum. The Trustees mandated that the building be designed by a nationally renowned architect, through a competition. Antoine Predock’s design was chosen by the Trustees as the winning vision, and construction began in 1992. 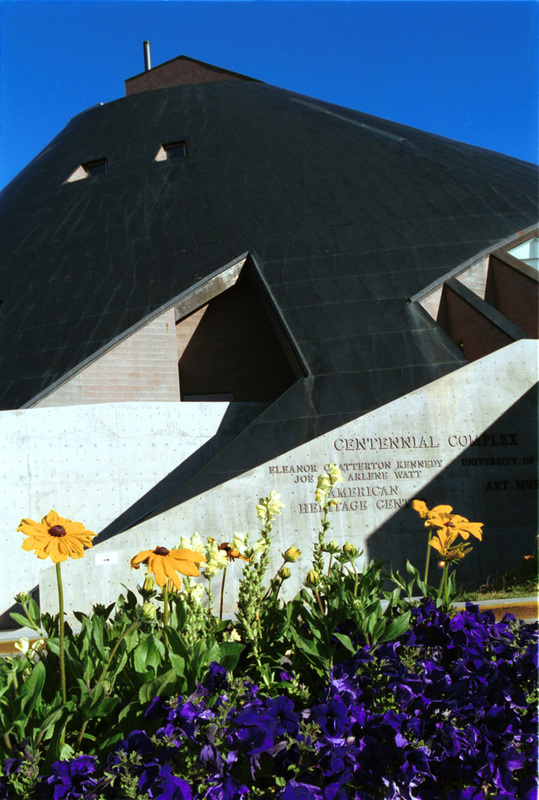 In 1993 the Center and the University Art Museum began occupying this facility, the multiple-award-winning Centennial Complex. The AHC occupies 60% of the building’s 127,000 square feet. To move the 80,000+ boxes of AHC collections from its three sites to the new storage space in the bottom of the new Complex was an enormous feat, a likely subject for a later post. Throughout Wyoming there is a sense of landscape in formation…. 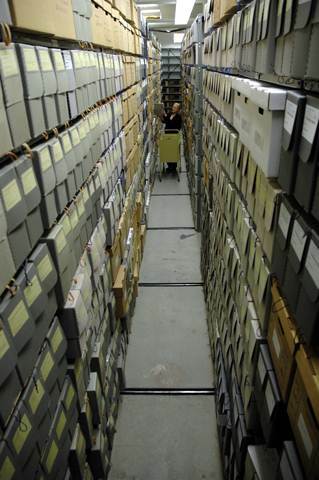 The appearance of this “archival” mountain can be thought of as parallel to the slow but certain geologic upheaval.…. The art museum is reminiscent of a village at the foot of a mountain. This archival mountain is axially linked to Medicine Bow Peak to the west and Pilot’s Knob to the east. [S]ite-specific alignments anchor the building into the campus and landscape. The building…recalls the gathering of Native Americans, French trappers, and early European settlers. Now it is a place of intellectual and social rendezvous. At the core of the mountain is a hearth with a timber armature that guides the flue up through the mountain to the sky. The floor levels wind around the hearth, each level rotating, creating a spiraling ascent to the sky-lit aerie. The AHC’s portion of the complex is named for Eleanor Chatterton Kennedy, daughter of a former Wyoming governor, and for Joe and Arlene Watt, cattle ranchers and descendants of Wyoming pioneers. The 2nd and 3rd Floors: Our Exhibits. The AHC is not a museum, but rather a primary source research center. Even so, we create exhibits for the same reason a museum does, to give visitors a glimpse into our vast and diverse collections. Exhibits cover a wide range of topics and even of purposes. However, over the years and for a variety of reasons, the Center permanently displays the premier collection of Western art at UW on the 2nd floor in the AHC’s Mary Story Loggia and George A. Rentschler Room (off the left of the Loggia as you enter) and on the 3rd floor just outside the public elevators. The Loggia represents an early forest with columns that resemble giant trees surrounding a welcoming fire. The George A. Rentschler Room with Henry Farny paintings on the wall. 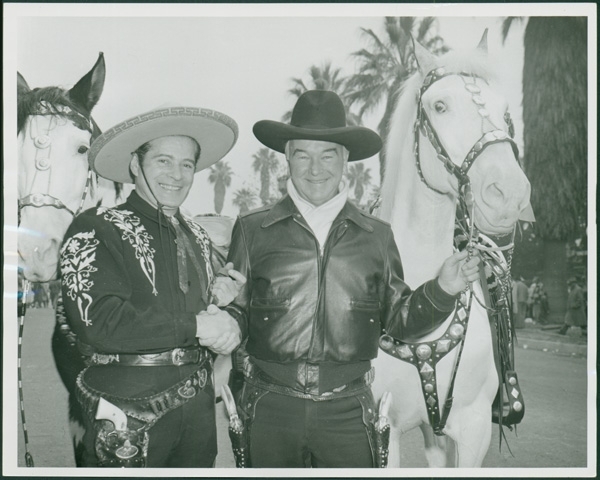 In the Loggia, notice displays of original saddles used by Hopalong Cassidy (William Boyd) and the Cisco Kid (Duncan Renaldo), as well as smaller displays introducing you to our wide variety of archival collection material. William Boyd, right, with Duncan Renaldo, left. The collections are available to visitors in one of our other public areas, highlighted later in this brochure. and an original bronze by Remington. The works were contributed by Rita Cushman in memory of her husband, George Rentschler; by the Everett D. Graff Family, Robert Graff, and Charles B. Nevins; and by Arthur Lafrentz. You will see Miller paintings on three of the Loggia’s four walls. Most lighting has been directed away from the paintings for preservation purposes; however, buttons throughout the Loggia permit visitors to temporarily highlight each painting. The Farnys and the Remington occupy the Rentschler Room. The Rentschler room is an exact replica of the industrialist’s New York City library. The room contains a state of the art fiber optic lighting system wired to motion sensors to reduce harmful effects of light to the paintings. Adjacent to the Rentschler Room on the 2nd floor is the Clara and Frederick Toppan Rare Books Library. The Library is open to the public, though appointments are suggested because the curator is often teaching classes. Toppan Curator Anne Marie Lane with a class of UW students. The Library is home to more than 60,000 items. The majority of the materials are printed books from the 1400s to the present, although there are also hand-illuminated manuscripts. 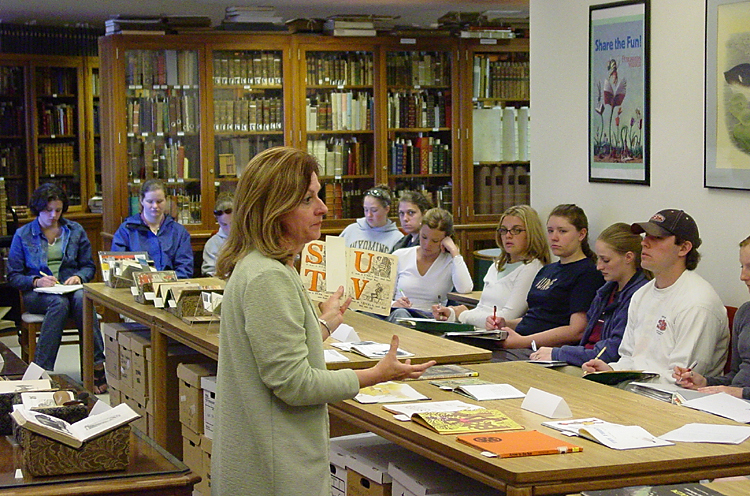 You will probably see dozens of items from the collections set out for a class on topics ranging from art to zoology and from exploration to world religions. If no class is present and if the curator or one of her assistants is available, don’t hesitate to ask to see the table displays. Outside the Toppan space are three cases filled with a changing variety of examples from the rare books collection. At the back of the Library is the Colket Room. Charles Howard Colket (1859-1924) traveled the world beginning in 1879 when he journeyed by horseback from Beirut to Bagdad. Select artifacts acquired during these travels, sometimes with his his wife, Almira, are on display in colorful Egyptian-style cases. Everything was donated to the University of Wyoming by the generosity of Mr. and Mrs. Tristram. C. Colket, II, who originally brought the items from the family home in Philadelphia when they moved to Sheridan, Wyoming. Also off the Loggia is the Wyoming Stock Growers Association Room, which is used as both a classroom and an events room. The room contains an exhibit on the history of the WSGA. 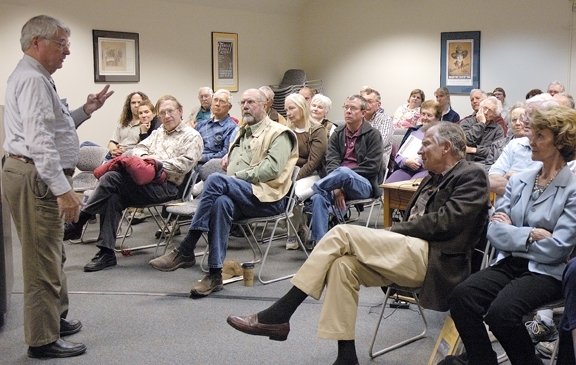 A lecture inside the Wyoming Stock Growers Room. The AHC’s 3rd floor is open to the public, but contains only administrative offices and work areas. However, to the right of the public elevator is a small exhibit of Alfred Jacob Miller field sketches and drawings, donated by Robert Graff. Dedicated spaces include the C. Paul Johnson Upper Loggia and the Terry Roark Administrative Suites. 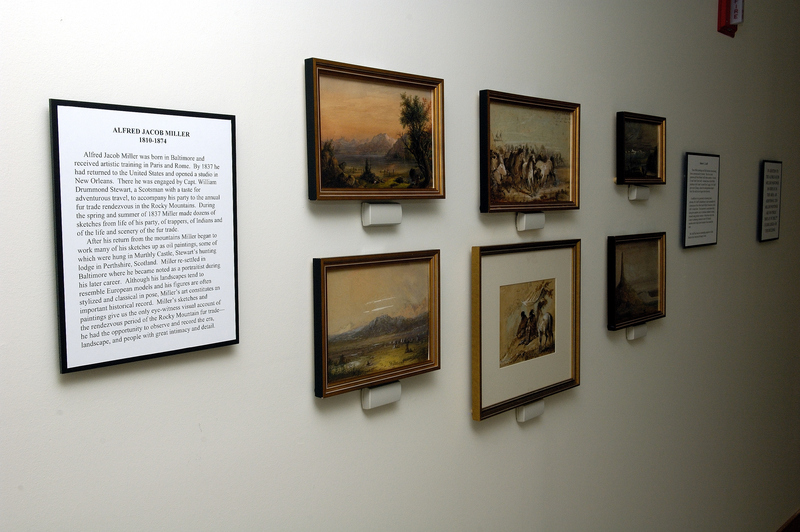 Small exhibition of Alfred Jacob Miller paintings on the 3rd floor of the AHC. The 4th Floor: Researching at the AHC. An important public space in the AHC is the Owen Wister Western Writers’ Reading Room in which students, scholars, and members of the public are able to use our original collection material. No appointment is necessary, though for first-timers we recommend arranging a formal meeting with a reference archivist who can help get you started. A very busy reading room! 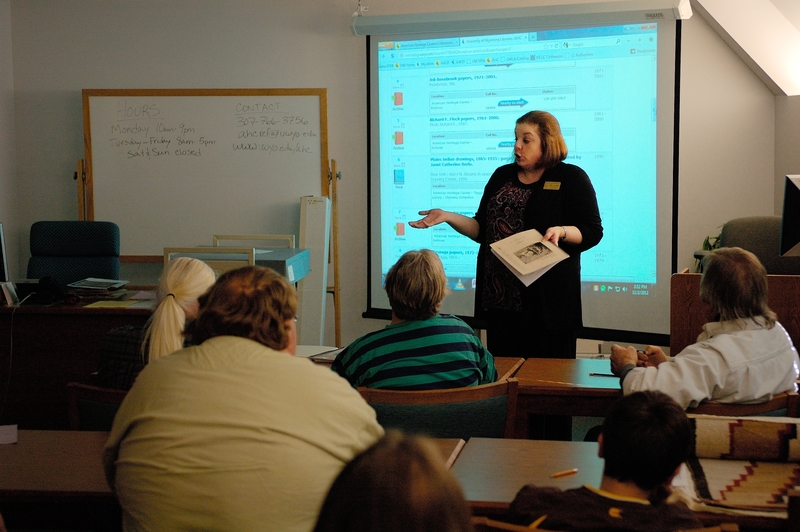 Ginny Kilander, head of reference, working with a group in the Alfred Jacob Miller classoom. The Alfred Jacob Miller Classroom is primarily used for classes of students—it contains reproductions of Miller paintings and a chronology of his life. Please call in advance to arrange for a visit to the Classroom. The Classroom was built for the AHC through the generosity of Robert Graff. The 5th Floor: Our Other Public Areas. The upper loggia of the 5th floor is dedicated to George and Linda LaBarre and the history of business. Across from the public elevator is a photograph of the founders of Cheyenne-based national business Taco Johns. The University Archives office and the Albert Gordon Wyoming Sheep Room (which serves as a classroom and meeting room) are on this floor. The walls of the Center’s 5th floor loggia display photos of Wyoming political leaders and businesses, as well as a small exhibit honoring retired U.S. Senator Alan K. Simpson. 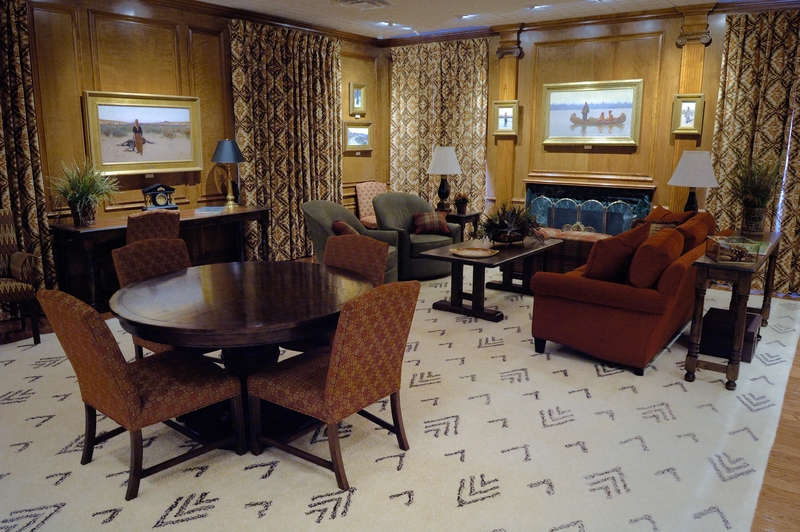 Next to the Simpson exhibit is the office of the Alan K. Simpson Institute for Western Politics and Leadership. Contact Simpson archivist Leslie Waggener for a visit by calling 307/766-2557. The Institute acquires new collections, conducts major oral history projects, produces symposia and other public programs, and supports student research in the history of Western politics and business. What You Don’t See. Most of the 1st floor of the AHC is not accessible to the public. By far the largest portion of this floor is storage areas for collection material. The storage areas are climate controlled and protected against fire, as well as having a three-tiered security system. Also behind the “Employees Only” sign is our Accessioning unit, the AHC’s photo lab, and our Toni Stabile Conservation Lab. Also on the 1st Floor (but not behind so much security) are the offices within the Abner Luman Reliquary that include the Wyoming History Day headquarters and the AHC’s Digital Programs department. More than 100,000 items (photos, documents, maps, and recordings) from our collections have been digitized, and are accessible anytime through our digital collections portal. Is it possible to be taken into the storage areas? Of course. However, we ask that such requests be made by appointment. While we can accommodate more for special occasions we ask that most tours comprise no more than six individuals. Call AHC director Mark Greene (307/766-2474) or associate director Rick Ewig (307/766-6385). This entry was posted in Centennial Complex, Virtual tour. Bookmark the permalink. Thank you for your comment! We’ll have someone from our reference department follow up with you.